Work Life Curbs Greece's Healthy Napping Custom Although cancer researchers may have found that a cat nap could reduce the chance of having a heart attack, changing work standards in Greece are making it harder for those that have held strong to siesta traditions to catch a few midday Zzz's. Despite a new Greek law that requires shops to keep uniform hours, many stores and restaurants along the streets of Avdou are empty from 2 to 5 p.m. — the hottest hours of the day. 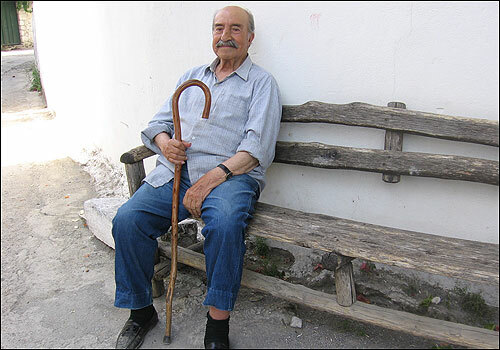 Michalis Fiorakis, age 101, comes out of his home in Avdou during the cooler evenings to greet people from this bench. 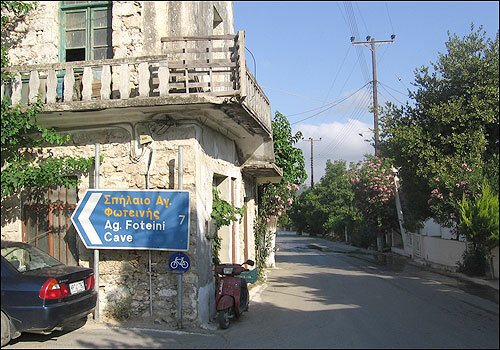 After napping, he goes to the taverna to eat and drink with friends. He's known for singing as he walks up and down the streets. 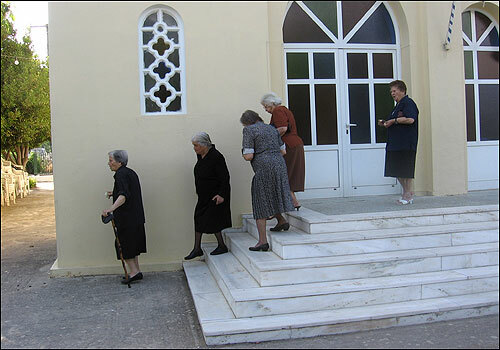 Women leave the Byzantine Greek Orthodox church in the center of the village. Only 160 people live in Avdou year-round, and the majority of the population is elderly in age. 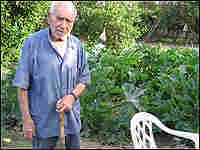 Iakovos Tzanakis, 85, works in his garden in the evening, when it cools off. He has worked and napped his entire life. Some say his generation might be the last to follow healthy midday napping practices. For most of history, climate shaped the way people lived their everyday lives. In some of the world's hottest places, people still take a midday siesta. But modern life is making that a rarity, even as science shows that napping may be good for your health. In the village of Avdou, it's siesta time. The temperatures hit 100 degrees, and on this particular town square, the restaurant is closed, and there's nobody sitting at the outdoor tables. The only sounds come from the church bells, which tell the time. The songs of birds are heard and the wind rustles the leaves of the mulberry trees. Avdou perks up after 5 p.m., when siesta is over. It's cooler now. The old women — dressed in black — pull up chairs outside their homes and chat with friends. The old men gather in the taverna for a drink, conversation — and even a song. About 160 people live in Avdou year-round. There was a big school, but it has been closed for years. Now most of the people here are older. When I ask Yiorgos Kalogerakis, a 98-year-old man whose name means "good old life" if he takes a nap, he arches an eyebrow at me. "Yes, it's obvious," he says. "If you do work, you have to get your body ready for it." I ask him if he's surprised when stores in the big city stay open now through siesta time. He shrugs and says it depends on the kind of work you do. Kalogerakis says that when he used to harvest his olive trees, he'd wake up at midnight because he'd have to walk miles up the mountain to reach his olive groves and work while it was still cool. Everyone I talked to in Avdou thought it was pretty clear that taking a midday nap is good for you. Now, a Greek Harvard researcher may have the evidence to prove Avdou right. It's a steamy afternoon in Harvard Square and here, people don't want to slow down, especially when they get approached by a reporter with a microphone. Across the river at the Harvard School of Public Health, Dr. Dimitrios Trichopoulos is busy with his research. "Napping is a response, an adaptation to the hot climate," Trichopoulos says. "Siesta is a very pleasant habit. In a way, it doubles your day. Because you start all over again at 5 o'clock and you can go on until 11 or 12 o'clock which is not uncommon at all in our part of the world." Trichopoulos' expertise is in cancer prevention. A courtly man at 68, he teaches both at Harvard and at the University of Athens. So he can't help but notice the difference in the pace of life in Greece and in the United States. "In the way life is organized here, you start with stress commuting," he says. "And you finish with stress, which is again the commuting. So to have in the middle of the day a time when you can relax, it can only be good, or at least not bad." Trichopoulos looked specifically at whether taking a nap gives protection against heart attacks. The results were published earlier this year in an American medical journal. 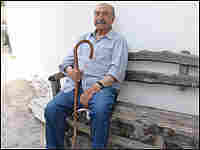 Greek men who napped at least 30 minutes a day were significantly less likely to die from heart attacks, compared with those who didn't nap. His theory is that napping helps reduce stress, which is known to increase one's risk of heart attack. Trichopoulos cautions that more study is needed to confirm his findings — but he's excited about the health implications. "If half of the effect we detected turns out to be true — only half — this would turn out to be one of the most important risk factors for coronary heart disease, almost as important as blood cholesterol or blood pressure," Trichopoulos says. Taking a nap may be about as good for you as exercise, changing your diet or taking pills. And, Trichopoulos says, it's of course more pleasant to take a nap than to reduce blood cholesterol or to try to reduce one's blood pressure. Trichopoulos, himself, only gets to nap once in a while now. It's a habit he grew up with, but lost after he started teaching at Harvard 20 years ago. Even in the hottest climates, the midday siesta is a disappearing habit. With globalization, people work longer hours. Air-conditioning shields them from the heat. Many live in suburbs and farther away from where they work, which makes going home for a midday nap impractical. In Crete, many people are trying to hold out against those forces. It's 2 p.m. at City Life, a gift store in Heraklion, Crete's biggest city. "With this heat, I go home and relax a bit and get ready to come here again," says owner Alexandros Adamis as he closes up the shop. But even the Greek parliament has stepped in the way of some napping traditions. "I'm embarrassed to say it, but we're not obeying the law," says Ioannis Silikos, head of the Merchants Association, the trade group for Heraklion's small shop owners. Two years ago, the Greek parliament passed a law requiring stores to keep uniform hours, like the newly arrived European department stores that are air-conditioned and stay open all day. The thinking was that standardized hours were more modern and would create new jobs. 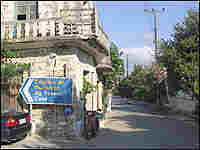 But in Heraklion, most stores are owned by individuals or families, and they have other priorities. "We would like our lives to be more human-oriented," Silikos says. "We want to be able to go to the beach during these hours from 2 to 5 p.m. We don't want to just have one day when we're free, which is Sunday." Back in the tiny village of Avdou, it's evening. A breeze cools the narrow, winding streets. 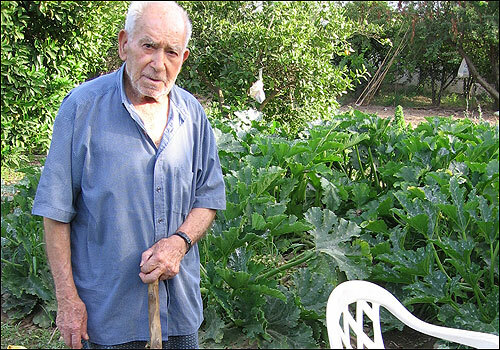 Eighty-five-year-old Iakovos Tzanakis has come out to work in his vegetable garden. He has worked and napped his entire life. But even as the world's climate gets hotter, the old men and women of this village may be the last generation to practice the healthy habit of taking a nap during the midday heat.